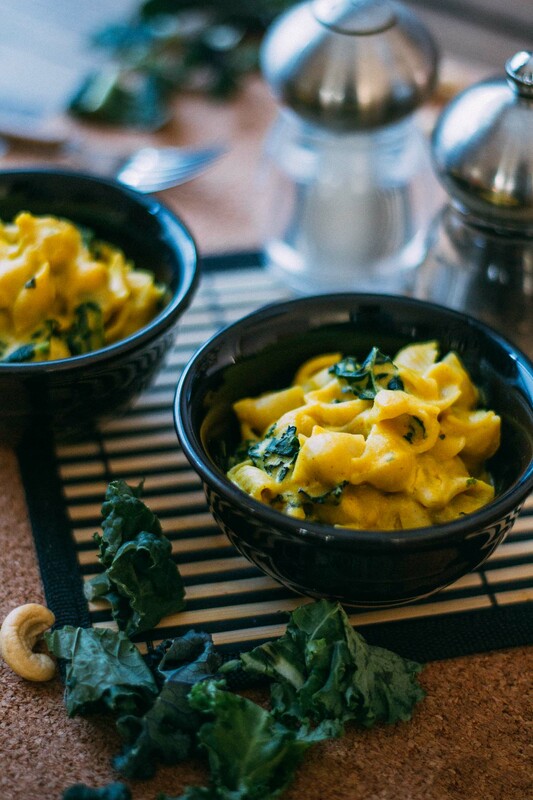 Our Oil-Free Vegan Kale Mac & Cheese is the kind of dish that everybody likes to eat! It’s creamy, savory, warm, gooey, sort of salty, melty and cheesy, so what’s not to love? It tastes terrific alongside a bowl of Cauliflower, Kale, and Carrot Chopped Salads and a crusty wedge of your favorite bread. Also, it makes a fantastic family dinner, and yet it’s totally delicious enough to serve with some sweet wine and share with friends! 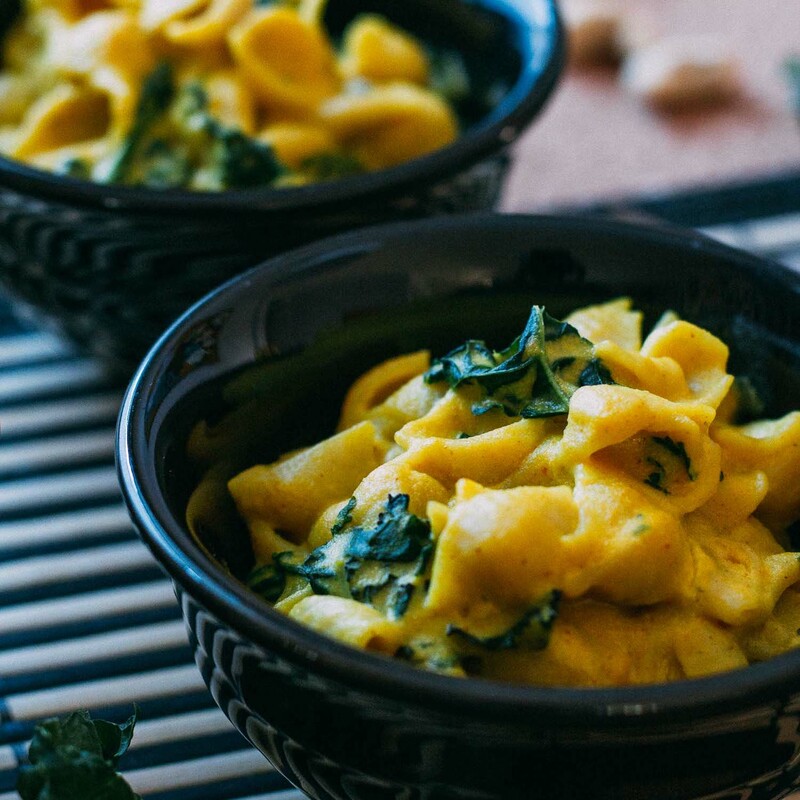 Here are the basic steps to show how easy it is to make homemade Oil-Free Vegan Kale Mac & Cheese! Second, cook the pasta and drain. Third, cook the onions and garlic and brown the flour and spices. Stir in the broth and lemon juice. Blend the cashews with the coconut milk and add to the cooked onion mixture. Finally, stir in the raw chopped kale and cook until kale wilts, toss in the pasta and serve! Above all other hosting memories, one of my fondest is of the first time I shared my Oil-Free Vegan Kale Mac & Cheese with non-vegan friends. Keep in mind that the meat-eating friends included two growing and always hungry, bacon inhaling, dairy cheese devouring, teenage boys. Of course, I was downright nervous about serving something I was calling “cheesy” with such a potentially tough crowd. Then, as we lingered around the dinner table enjoying each other’s company, I noticed the boys and their parents eagerly helped themselves to a second and third helping of my magical Oil-Free Vegan Kale Mac & Cheese. And as I soaked in the apparent success of the vegan meal we’d just shared, I identified an undeniable fact; good food is good food! There’s no need to use complicated labels to identify our dishes other than when someone specifically asks. Mac and cheese by its lonesome will likely never register as a health food. But loading it up with kale turns this decadent side dish into a complete, well-rounded meal! 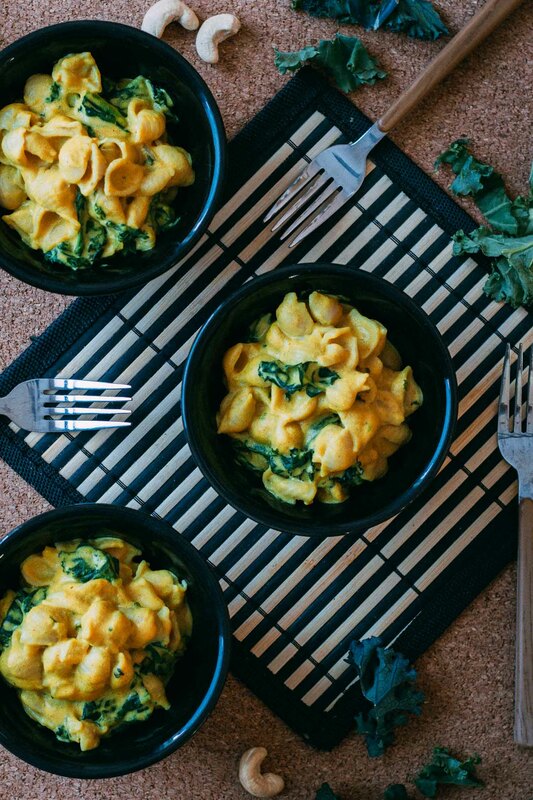 Kale gives our Oil-Free Vegan Kale Mac & Cheese recipe a hefty shot of vitamin A, C, K, and B6. And it also boosts valuable minerals like iron, calcium, and potassium, too. If you’re anything like me, you may have walked around a few decades or so with the idea that healthy plant-based food and food that tastes good are two very different things! But as I dug into cooking to support my meatless lifestyle, I soon realized that the flavors I’d associated with food that is satisfying have nothing to do with meat or other animal-derived product. On the contrary, savory flavors have everything to do with spices, herbs and other methods of seasoning! In fact, left unseasoned, meat and dairy have minimal natural flavor. It’s how we develop dairy that makes traditional cheeses edible, and the same is true of meat, too! Think about this: there is no such thing as a pepperoni flavored pig or cheese flavored cow. Spices are added to make what we favorably recognize as pepperoni. We age, heat, and grow mold and do all sorts of things to milk to make a dairy-based cheese we enjoy. 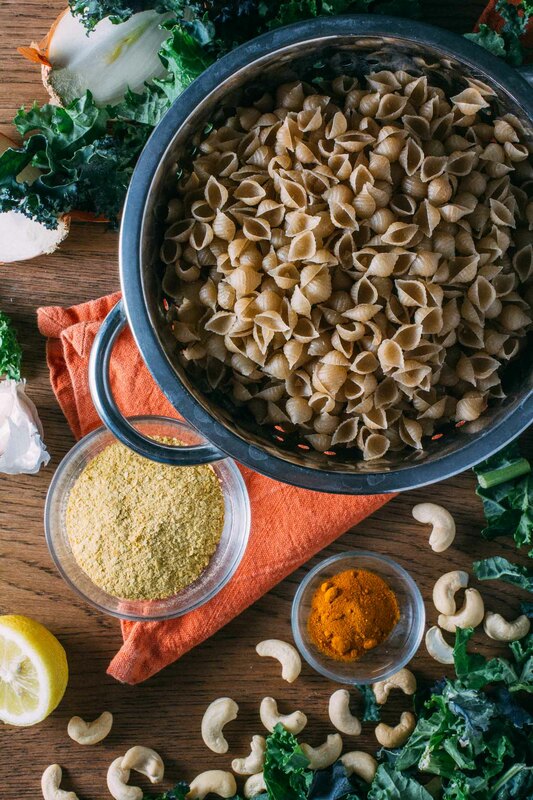 Awesomely familiar and comforting flavors like the dreamy cheesiness of our Oil-Free Vegan Kale Mac & Cheese, are created with natural, thoughtfully seasoned, cruelty-free ingredients. And if you want to take this dish to a whole other savory level of mouthwateringly familiar flavor, pull out all of the plugs and adorn each serving with a sprinkling of Fakin’ Bacon! 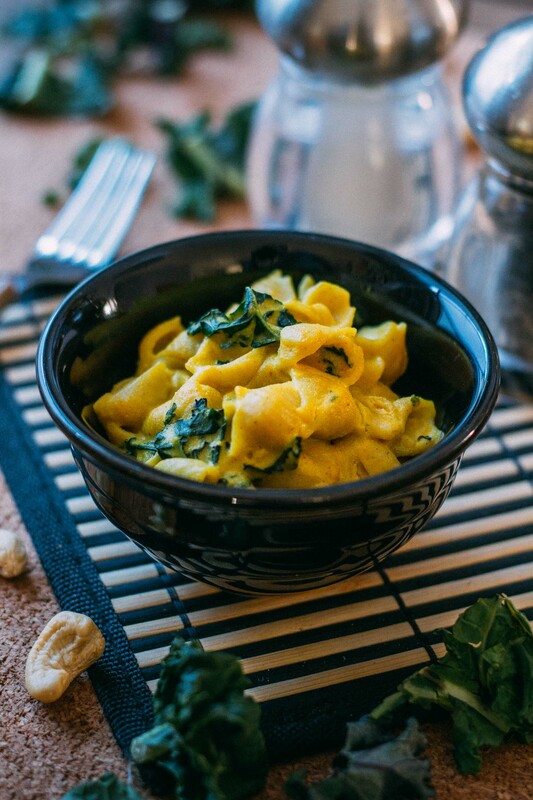 Leave us a comment to let us know how much you enjoy your homemade Oil-Free Vegan Kale Mac & Cheese – we’d love to hear how it goes! 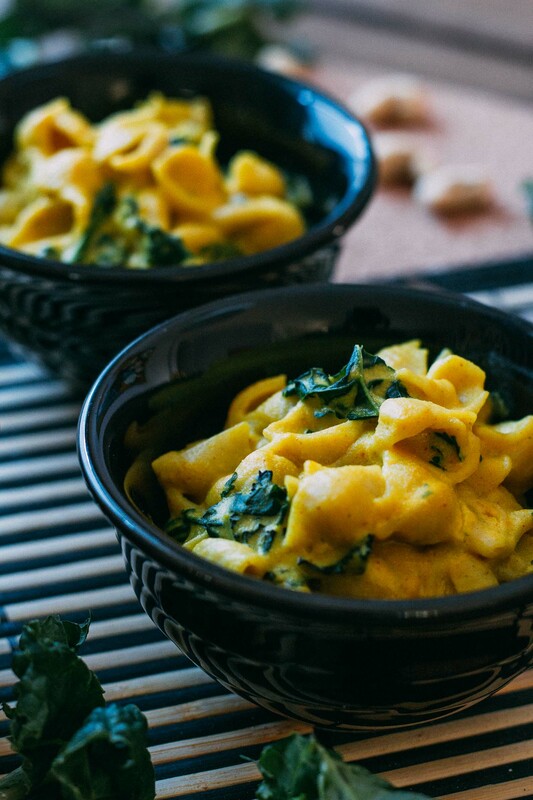 You can feel confident serving homemade, Gluten-Free, Oil-Free Vegan Kale Mac & Cheese to vegan and meat-eating friends, alike! It’s a genuine comfort food crowd-pleaser that is sure to be a hit at your next social gathering! 16 oz bag of rice pasta, Tinkyada brand is fabulous and widely available. 1 cup of raw cashews, soaked and drained - I like this brand and pound for pound, this is a terrific deal! Before preparing the rest of this dish, first, soak the cashews in enough water to be sure they're completely submerged. It's entirely okay to begin to soak the cashews the evening before you plan to use them or the day of use. 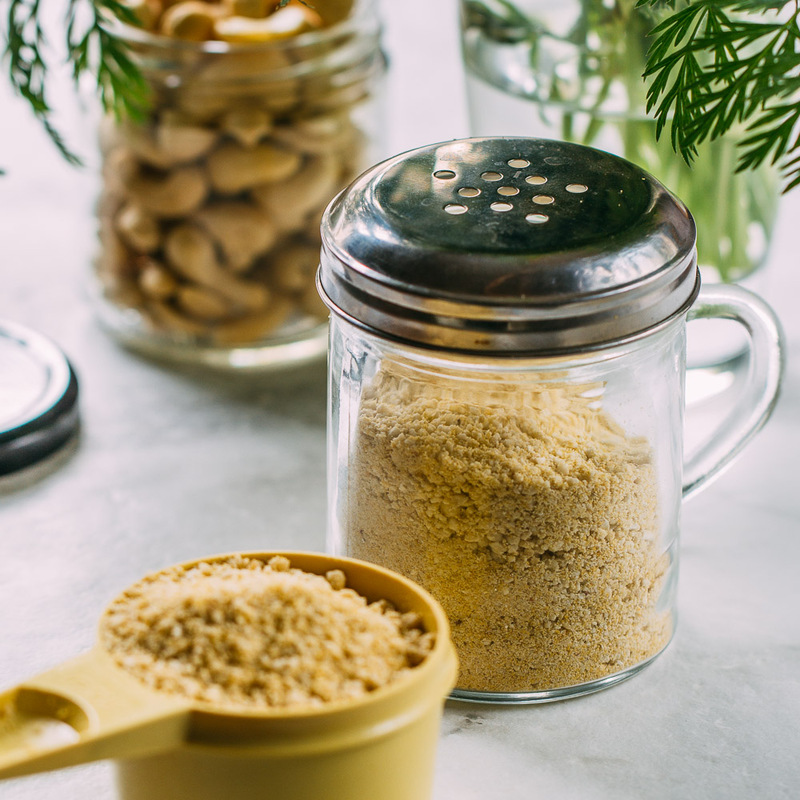 If you need a quicker soaking time, heat about a cup and a half of water and soak the cashews for as long as you can before using. Even a half hour of soaking is enough to soften them up using this quick method. Coincidently, the longer they soak, the easier it is to arrive at a creamier "cheese" sauce. While the cashews are soaking, cook the pasta according to package directions and drain. Meanwhile, as the cashews continue to soak and the pasta cooks, place a bit of the veggie broth in a large pot over medium-high heat and cook the onions until they wilt just a bit. Next, add the minced garlic to the pan and cook for a minute or until the aroma releases, adding more broth as needed to keep things from sticking. Next, reduce the heat to medium and sprinkle in the flour and spices together with the onion and garlic. Allow the mixture to cook just a bit and gradually stir in some more of the broth while breaking apart any flour clumps. Gradually stir in another cup or so of the vegetable broth and bring to a low boil to thicken. Add the lemon juice and reduce the heat to a medium-low simmer. Meanwhile, as the broth simmers and thickens, put the drained cashews, coconut milk, and any remaining vegetable broth into the blender. Blend the ingredients until it reaches an utterly thick and creamy consistency. Now add the luscious cashew cream to the simmering onion mixture a little at a time, stirring to combine. Next, sprinkle in the nutritional yeast and stir. Now add the raw chopped kale, stirring while cooking until the kale wilts to your liking. Taste for seasoning and add salt and pepper to your preference. Add the pasta to cheesy kale sauce and taste once more and adjust as needed. 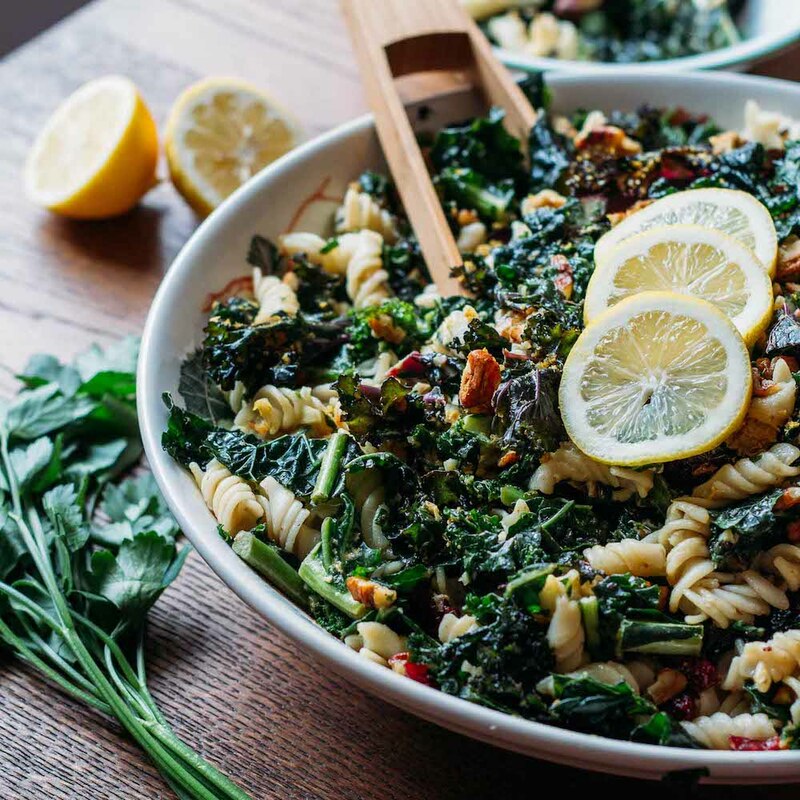 Serve your homemade Oil-Free Vegan Kale Mac & Cheese while it's hot with a lovely side salad and bread. Top with our Vegan Fakin' Bacon for extra flavor flare! To lighten this deliciously healthy mac and cheese up even further, use lite coconut milk which will reduce the calorie and fat counts. If you prefer a soupier stovetop mac and cheese, use a little less pasta. To intensify the lovely golden color of this dish, add a bit more turmeric powder. 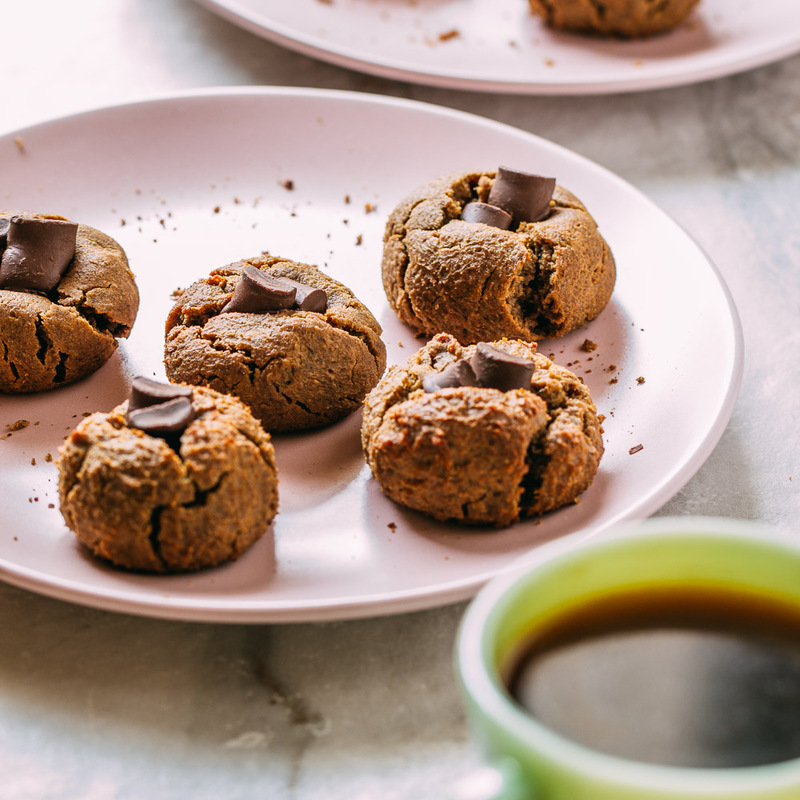 The products highlighted in the color orange in this recipe are available by clicking and purchasing through Amazon for your convenience. Many such items are chosen because they are the best value for the quality. Often, the products are bundled and presented in bulk purchases to reduce the price per piece significantly. This was easy to make and so decadent. I did add a few items to cater to my tastes and a thicker consistency – a few tbsp of dry mustard and miso, arrowroot thickener, and cut back on the yeast. This was the best sauce ever. It was unbelievably rich, decadent and scrumptious. I used the pasta you recommended and it was delicious as well. Yummy! It’s so good to hear that you enjoyed your Oil-Free Vegan Kale Mac & Cheese and it’s so cool that you made it your own! And isn’t that gluten-free pasta just the best? Thank you, so much, for sharing your positive experience, Brooke.